This project is a collection of studio conversations gathered into chapters published seasonally. 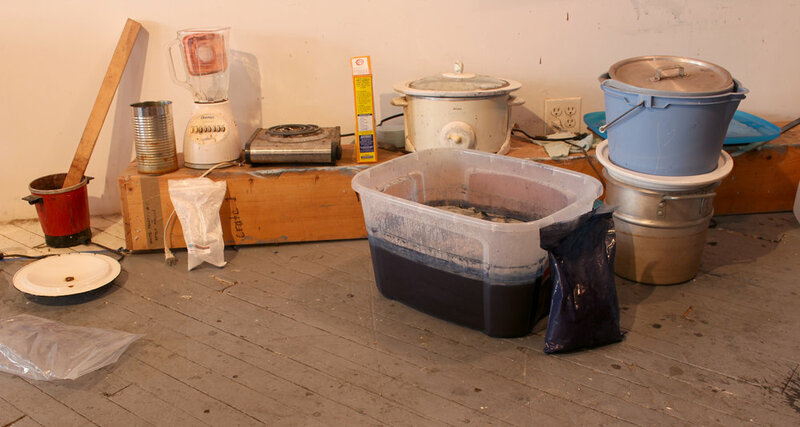 Byron Kim spoke to us twice, once in his Gowanus studio, and again while gathering acorns for dye in Prospect Park. 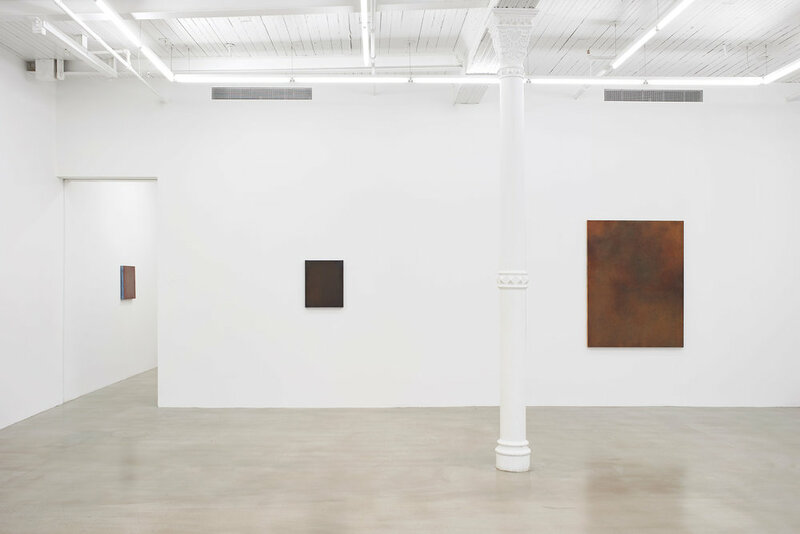 His willingness to consider the materiality of his recent paintings within the rigor of his conceptual engagement gets to the heart of our desire for this collection. Many of the works spoken about in the following conversation were later on view in a December exhibition at James Cohan Gallery, Mud Root Ochre Star. Thoughtful responses can be found here. Byron Kim - We should get some acorns. Martha Tuttle - You collect acorns for dyes? BK- I did. I don’t know that much about acorn dyeing except for one recipe. It just seems intriguing to me, because they are so easily available here. Mariana Garibay Raeke - Where did you find them? BK- I’ll show you if we walk up to the long meadow. MT - What are you currently working on? BK - I am working on three different projects. The main one is a series of paintings that were trying to get the idea of a bruise across, but not necessarily doing this as a literal depiction. They started several years ago, from a passage in a Carl Phillips poem. One thing that became kind of analogous to me was how much the bruise can look like something celestial. Like photos of really deep space taken by telescopes, or from satellites. I am dyeing fabrics and then using oil and glues as the next steps. Those processes are a little bit against each other like oil and water. Dyed fabric looks very dry, but when you stain it with oil it appears to be wet. MT - What was the first dye that you used for this project? When I started, I decided to only use natural pigments because it was a natural subject matter. I began to think of a bruise as a stain under the skin. I was thinking about the blood and the iron in the blood and decided to use mostly iron oxides. At first I was painting on steel, rusting the steel and painting with oils. Now I am dyeing fabric with natural dyes. The process with steel was so hard and this is so delicate, but both deal with the same subject matter. MT - Did it feel like a natural trajectory? BK - It felt like a natural transition. I can’t remember what caused me to change. I think frustration with the metal. It is so heavy. I worked with it for close to a year. MG - What else are you working on? BK- I am in a group show in Korea that opens in about a month, which I am working on two things for. One is something that I have done in the past, which is to make a flag that is the color of the sky. Before I have painted it, because it was important to me that it was a painting (you know, because of Jasper Johns). This time it is dyed indigo. It is not exactly the color that I would have painted it, but it is astonishingly close. It’s the kind of thing that makes me question my atheism. The fact that indigo color can be like the sky color. There are very few blue things in nature. Indigo is green and grows out of the earth, but when you put it through the process of the fermentation needed for using it as a dye it makes the color of the sky. It is just crazy; it is a really strange, beautiful thing. MT - Originally, the color that you painted the flag was as close to the color of the sky as possible? BK - I wanted to make a flag the color of the sky so it could sort of disappear. But of course it can never work because it has light and shade. There are momentary parts of it that blend in but most of it is lighter or darker depending on where the sun is in relation to it. MG - Still, there are those moments. BK - Yeah, which is maybe more beautiful in a way, that it is not all the time. Byron Kim, Sky Blue Flag, 2015. Acrylic on canvas and flagpole. MG: Has working more materially changed your approach to making? BK: It’s changed in that I think it’s more enjoyable. Getting more invested in the materials relates to my scientific interests and that part of my brain. Because before when I didn’t care as much about the materials, when I was more of a conceptual artist, I was interested in the idea, and the end product. So making the thing was more like a chore. And as you know, making the thing is 99% of the process. Coming up with the idea is, well for me anyway, instantaneous and only comes once in awhile. But there’s this weird fallacy about art, that it’s all enjoyable because you’re doing what you want to do. I am certainly doing what I want to do. But that doesn’t necessarily mean that it’s fun. So the other way that I might put it, is that working with material is fun, and I enjoy it more. Does that make sense? MT: I think it gets to a key part of our conversation around materials and making. That the pleasure is significant, it’s own intelligence. BK: I know! And I’ll tell you another thing. In Korean, the word for fun, and the word for interesting are the same word. Like...when you say fun or interesting it means the other thing too. MT - It seems like in this way of working there is a new relationship to the unexpected? BK - It is like having another tool in the toolbox...to be able to use these materials more freely, to get the materials to do the work more. Before, I wanted to be in control of everything and now I am more hoping that the other things will take over, which is why the dyeing and staining is interesting to me, even if it is frustrating and aggravating also. It has less to do with my drawing hand. MT - Why are dyes fun? BK: Dyeing takes you back to the source of the material, unlike what you do with painting and other media, which is squeezing the tubes. The other thing is the magic quality about it. This is hard to explain to anyone who has not dyed...before. Direct dyeing with madder root is pretty straightforward. You boil the material in water and you get a color liquid that is usually well related to the color of the fabric you end up with. With indigo, it is this weird thing. You are putting the fabric in this liquid that looks green and smells terrible, and it becomes this beautiful blue color after it oxidizes. That is the thing that is really fun. MG - The process of dyeing is physically different from that of painting. How do you think about your body in relation to this new process? BK - It is a physical process, and that is...interesting for me. I am naturally more in my head and not in my body, but maybe that it is part of it, a part of the fun. I am forced to pay attention to my body more. With oil painting, it is more cerebral. That is misleading to say, but I think you know what I mean. BK: I am still answering your first question. The other thing I am working on is for The Anyang Public Art Project, in Korea. It is a little painting, engaging with a Korean Buddhist consecration practice, 12 inches wide and 14 inches high. It is going to be silk or ramie and using natural dyes. From medieval times until now, in certain Buddhist temples in Korea, in order to consecrate the main statue of the Buddha in a building- to make it come alive metaphorically- they perform an enshrinement. 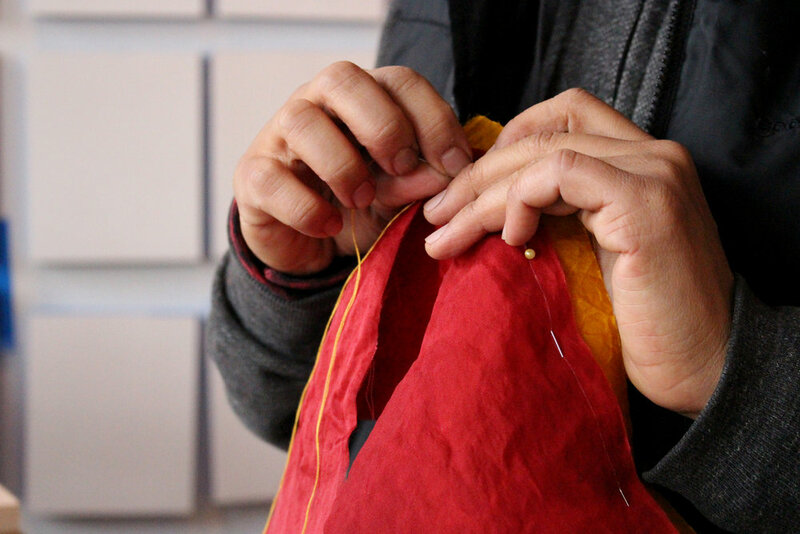 Five pieces of cloth are dyed in the five cardinal buddhist colors, which are black, white, red, yellow, blue, and then put inside the statue. And then the buddha comes alive and the temple is alive. So, that is what I am working on - those are the three. I really want to come up with a fourth thing so that when these things end, I can start working on something new the day after the deadline. MG - All of your current projects involve using dyes in some way? BK -Yes. The flag one veered that way. When I went to Korea to figure out what I wanted to do, I had natural dyeing in my mind. 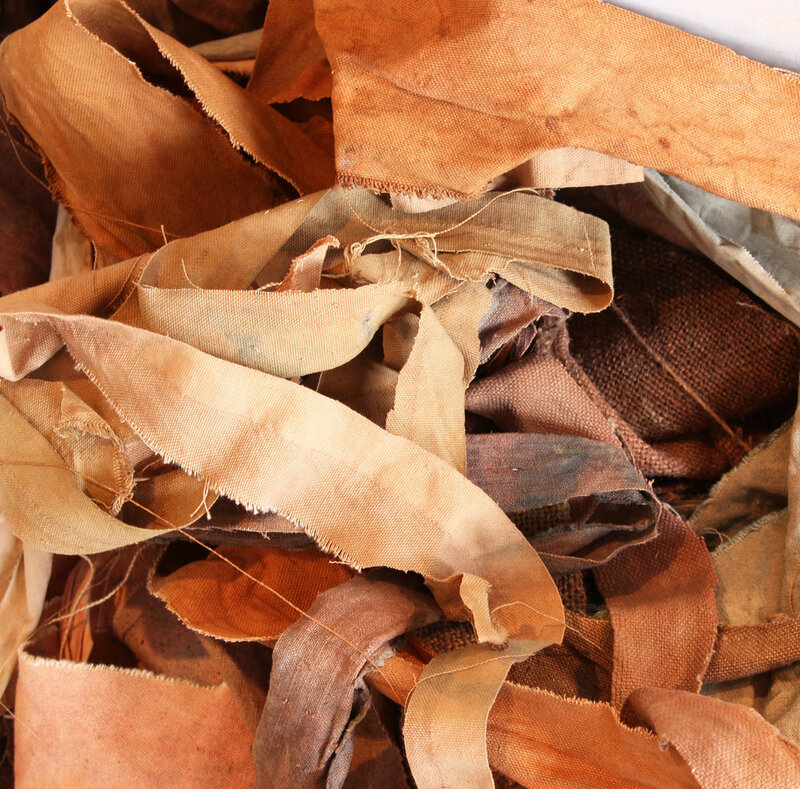 It is surprising what you can get from natural dyes. The bruise paintings are so subtle and muted, and the one with the Buddhist enshrinement colors is so bold and bright. MG - Could you tell us if you think about time in your work or time entering your work? BK - I think besides color, time is the most important aspect of my work. When I was younger, in my twenties and thirties, I read Robert Smithson’s writings. His way of looking at time, not only geologically, but more expansively, in terms of the age of the universe affected me a lot. I think of that when I am thinking about what my paintings are about. When I think of the bruise, it became related to some cosmological content, just because there seems to be some visual similarity. I am always trying to relate the very small and the vast, which I learned a lot about twenty five years ago from Smithson and I relearned it by reading Chuang Tzu’s The Inner Chapters an early Daoist text that talks about the relationship of the small to the big. Somehow this is related to time for me, in the sense that it gives me a sense of scale. That we are here for such a small moment of time, that time and space are so unbelievably vast, which is what those paintings that I make are supposed to be about, that opposition. MG - What about color? You mentioned it being one of the most important aspects of your work. BK - Color has always been the most interesting thing to me since I decided to become an artist, or, the more honest way of putting it is that...color presented itself as an interesting subject because it is so confounding. Color is...meaningful to me because it has no meaning. People have all of these associations but it is something they came up with or someone came up with for them. It is really interesting. I have been learning that there is not that much blue in nature, but still the sky is blue and it is so vast. I was listening to a radio program recently that said not so long ago people did not understand that the sky is blue. Like when you read Homer there is no mention of blue or maybe only once, that when you look at different cultures at that time, people were referring to green but not blue. What does that mean? How can the sky not be blue? I do not understand that statement at all. It can only mean that the sky is nothing - it’s the equivalent of white, which makes some sense because it’s the brightest part of our environment. MT - Tell us how process has helped you to think about permanence. BK - I think it gives me a...more considered relationship, or sense of time, with whether things last or not. The art world wants things to last forever, yet we all know it’s not going to last forever anyway. The other day I ran into Marty Eisenberg. He and his wife Rebecca owned a few of my earliest works. He said that his family had lived with and enjoyed my work for about twenty years and had just donated the works to the Brooklyn Museum. Such a beautiful sentiment. Their experience with the work was long term, but, ultimately, temporary. So now I’ll expect a call from the Brooklyn Museum about the exact materials I used to make the work. Museum conservators are like plastic surgeons. They can extend the appearance life of the art. Smithson has a hilarious and profound take on this. I think there’s a drawing where he portrays the museum as a mausoleum, where art goes to die. Of course, I don’t exactly look at it this way. It’s wonderful what the Eisenbergs did and wonderful what the museum will do to allow more people to enjoy the works indefinitely, but not forever. Someday, even the museum will be gone. MT- Is having awareness of how a material changes important to you? BK - Yeah, I would prefer to know what is going to happen. I would like to know how long things last so I can be ... intentional about it. Of course, change can be part of the work. MG - Is this something that has become more present since you began to work more directly with materials? BK - I think so, but what I would say about that is that it should have been equally present before. I know pigments and dyes have different properties, so I am using them very consciously. It is just like lots of art things. It’s weird that I trust what others are saying about the materials I buy, what the corporation that makes art supplies is telling me. I need to find out about that myself. So now I am getting information from different sources. Sometimes you put things together and you bring your best understanding, but you are not going to know everything. The surprises that happen are usually good. 18 x 15 in. Courtesy of James Cohan Gallery. Image Phoebe d’Heurle. MG - How do you feel about fragility? BK - It depends, like I made a body of work that was purposely fragile in a certain way. I made paintings with modelling clay, called Permanent Paintings. If something gouges it or disturbs it in an acute way, years later you can fix really easily because it never dries. In other ways it is really fragile. You can look at it in both ways. It will change by just touching it, but you can fix it just by touching it again. I made those paintings just for those qualities. With an oil painting, if you touch it casually it is not going to be damaged. MG -Are there objects that are interesting to you because of the ways in which they have aged? BK - I always go to Ad Reinhardt’s black paintings. In most people’s minds those don’t age well just because that kind of work can’t be better than when he just finished it. Eventually something is going to happen to it. Although I don’t like the idea that people have touched them and that is how they get damaged, I just like the indication that they have been out in the world. It is an unintended consequence of making paintings that are so black and so matte. They are almost not made to be in the real world. Alternatively, sometimes I look at a Chinese painting and I can’t place even what century it could have come from. Even the possibility of being a millenium off, you know? This is partly my art-historical ignorance, but it also has to do with the materials, skill and tradition...somehow people knew a long time ago these materials would last. So I am looking at this thing and it has not aged significantly despite the fact that it was rolled up and carried around and stamped and then rolled up and passed on and rolled up, etc. I can not tell if it was made a 100 years ago or 800 years ago. How is that possible? That seems crazy. It seems impossible. Ad Reinhardt’s paintings are not going to look like that 100 years from now unless there was one in a crate in perfect conditions. MT - Isn’t it kind of devastating to think that there is a painting in a case like this that we will never see? BK - Yeah, but it’s also sort of a beautiful thought. MT - What is beautiful about it? BK - The idea that somebody in the future could see it in a way that we didn’t get to see it...To me that is the whole thing. Byron Kim received a B.A. from Yale University in 1983 and attended Skowhegan School of Painting and Sculpture in 1986. He has been exhibiting in solo and two-person shows in the US and internationally since 1992. His work is in the permanent collections of the Art Institute of Chicago, the Whitney Museum of American Art and the National Gallery of Art among others. Kim lives and works in New York and is represented by James Cohan Gallery.